This setting changes the way a program is viewed in the Graphics mode. When it is OFF, rapid (non-cutting tool motions do not leave a path. When it is ON, rapid tool motions leave a dashed line on the screen. 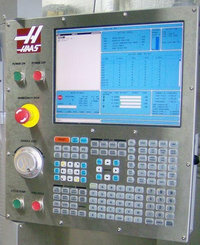 Haas Lathe Operator’s Manual by Haas Automation, Inc.
Haas Mill Operator’s Manual by Haas Automation, Inc.